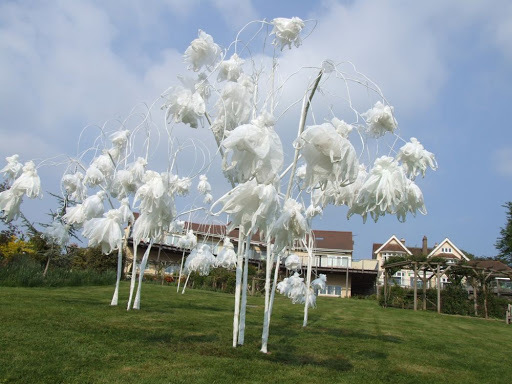 Brief goodbye to plastic bags, for how long will they still be around? but then I opted to have them separated to not take away and distract from the industrial site of the Rhondda heritage Park, also because this last piece felt a bit forced upon it and in fact was like a double ending. 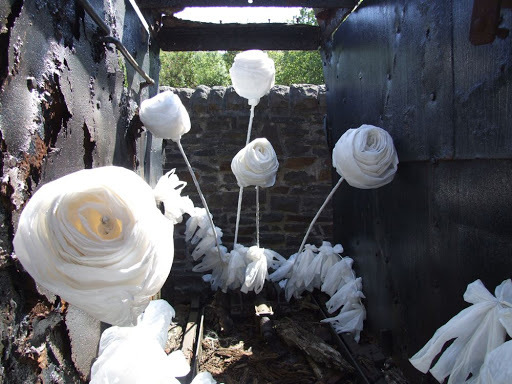 A bunch of plastic: three hundred recycled plastic bags, taped, moulded and attached to sticks to form a large white bouquet of roses. Flowers, to commemorate what has been, the moment that will pass, and what will be forever. Flowers to remind us of the cycle of lives that keep crossing paths in the most unexpected ways and places – their mingling genes breeding into the future. Plastic bags just like coal are on their way towards extinction to give way to the new. Still they will remain in the memory of our life, to be archived as historic symbols of an era: each icon chronologically evolving from the other and their inputs designing our environment, our culture and our society. Both, coal and plastic bags, have shaped our modern life style and have fuelled the continuous struggle between man and nature, leaving the Rose as a survivor and a living proof of a more successful collaboration between man and nature. As undeniably everything affects everything, roses will carry the genes of history into their sprouting buds to renew their symbolic function and to once again commemorate hope. Right after North Devon I rushed to Wales. Again it was another very interesting and nourishing experience and the sun shining on the glorious landscape made it a very uplifting journey. So I visited for the first time the Rhondda Heritage Park: an old mining place now a museum. There I set up a small art work to be part of their upcoming exhibition: ‘Inside out’ curated by Janet Pennell and organized by ‘Up Yer Tree’ founded by Wendy and Brian who I all had the pleasure to meet and briefly enjoy their company. 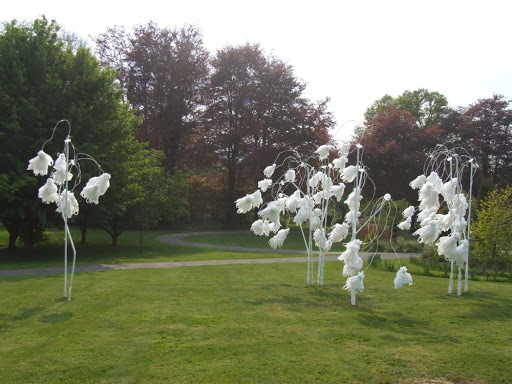 Twenty metal trunks rooted in cement, their hundred metal branches all wrapped up in plastic, each carrying it’s white flower: six hundred and fifty plastic bags altogether, floating in the air. All bags repurposed from previous works, all concrete bases recycled, all metal poles recuperated from their earlier shapes planted for the NSP where they lived at Broomhill for one year. I don’t know for how long they will last this time; at some point the decay it’s inevitable, hopefully well before they will start to be taken for granted and become overlooked. To feel neglected, wouldn’t this be a valid motive to speed the process of decline? Like a real plant this artwork needs tending, attentions, and looking after. That’s the nature of the work: to mimic nature and a metaphor for life. My main worry? Will the work weather gracefully. I know it will transform somehow, hopefully without detracting from the perfectly beautiful surroundings but interact with it instead. Ideally creating some enjoyable moments of thoughts, reflection and conversation that art can so well provide us with. These vital acts could only nourish the artwork and its metamorphosis, making it grow stronger in purpose, deeper in concept. Then all its physical changes would not be in vain but as significant and meaningful as its imperfect beauty longing to be monitored. 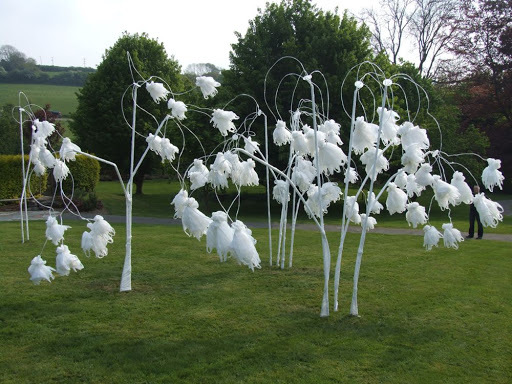 I cannot help but feel that my work fits in and is perfectly complemented by the hospice environment, if not just conceptually for the idea of cycle that the work lives of. This opportunity came at the right time of my life, when I am starting to dwell with sad thoughts about my aging parents. The harmonious energy I could breathe during my brief visit at the hospice and its carefully looked after gardens have fed my imagination making me hope for all hospices to be just like that. I came away with an uplifting and positive outlook that is already reflecting on my relationship with my parents. Hopefully I was able to honour the place and their people and to give something back. Only the desire of making art had stop me from surrendering to the twittering of the birds and let my curiosity be lulled by the mystery of what life will bring next, fantasizing of all its forms and shapes. I am back from my trip to North Devon. 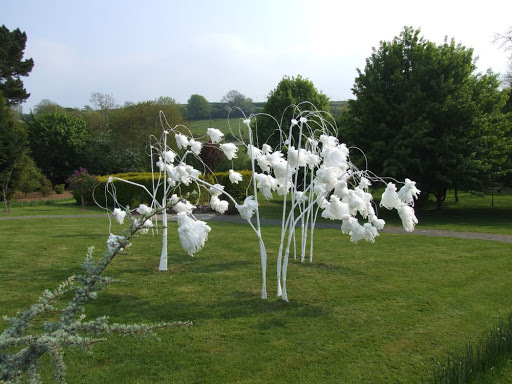 I spent 2 and 1/2 gorgeous days at the Broomhill Art Hotel getting spoiled by Rinus and Aniet while setting up the work for the North Devon Hospice. The weather was splendid and so the surroundings that contributed to soothe my chronic frenzy state my mind drags me into every time I set up a new piece! The Atmosphere at the Hospice was very layback and relaxing, everybody was so amazingly supportive that I felt immediately at home and wished I could spend more time there not just in those amazing gardens and manicured grounds that extended out from the main building terraces, Wow, what a view! But also made me want to see and find out more of the people inhabiting the house: some enjoying life in many different ways, I suppose, some at their last stages of their life, taking in all the kindness and beauty, some other witnessing and learning from that experience. I feel there is so much to learn from it and I am eager to soak into that knowledge especially now that my own parents are getting older and I don’t know nor understand what that means and how it feels. How do I deal with such circumstances and stay positive, extra tolerant, loving and giving and ultimately more open minded? Anyways I thought the Hospice is a magnificent place for anybody to visit and spent time in. I can only hope for all hospices to be like that! I would like to thank everybody I met at the hospice for having given access to me and my work. It has been a great pleasure to see another side of life and how positive that can be. My only greatest worry and concern is for the work being up to this occasion and interacting gracefully with the weather of course! 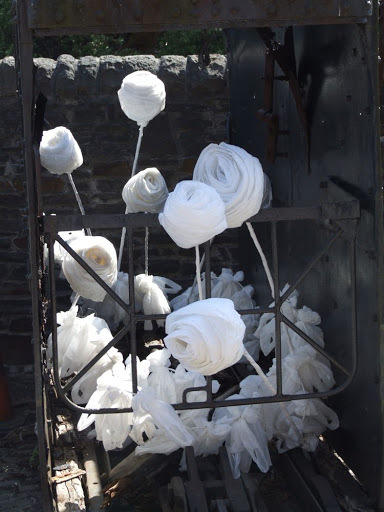 In fact the day after I had left, very strong wind started to pick up…….hopefully the work is still up and a source of enjoyment if not visually maybe intellectually providing for more thoughts and conversation within the hospice community making their stay even more enjoyable. 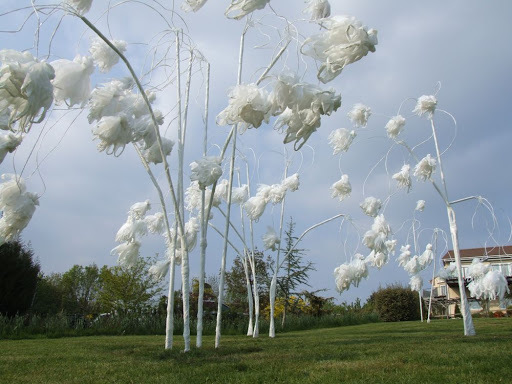 I personally feel that my work perfectly fits the hospice environment if not just only for its concept that plays with the idea of moment and eternity and with the idea of cycle and transitory ephemerality. I cannot ever thank enought Rinus and Aniet Van de Sande of the Broomhill Art Hotel for their generosity, amazing support and for creating this opportunity for us artists. It has certainly opened new doors to look into for me. Also I would have not been able to do such a neat and quick job without the precious help of Paul Cowie. 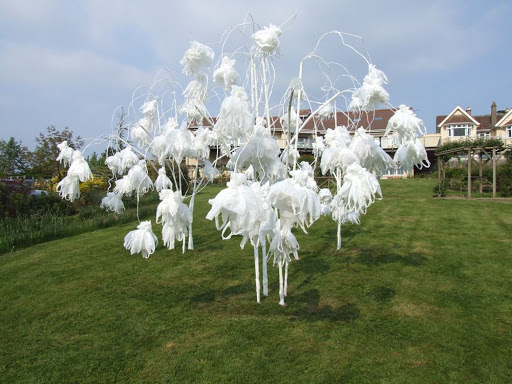 BAGS HISTORY: The plastic bags composing this work are the very same ones that previously formed the pieces: ‘Dancing with Waves’, ‘parts of: ‘Like a fish out of Water” and of ‘White noise’.